I didn’t know I was getting you until the day we picked you up. You were sleepy and not very playful that day. I had planned on doing my own temperament test, but you and your 10 sleepy siblings were not very cooperative. We were told you were a show prospect puppy that would be “perfect” for us. You were Yellow Boy. Looking back, should I have seen the red flags? Like when you threw up in the car on the way to the airport. Or that you never wagged your tail or gave kisses… ever. When the sound of a pot softly set on the stove would send you running for cover. That you refused to eat, no matter what I fed you. Or when you almost got yourself stuck in the pool gate because you were so frightened by the pool. You were never less than 20 feet from the pool, but yet, you were terrified. You were just so fearful of everything around you. Why? Eventually, you decided life in our home wasn’t so bad. You enjoyed your kids. You loved Burton and the play dates you had with Sugar the Lab. As a puppy, you enjoyed your walks around the neighborhood. You loved to play fetch and tug with your Kong Wubba while I was busy putting the kids to bed. Those were fun times for me too. I loved to see you lighthearted and happy. Looking back, could I have done anything differently? Could I have done more? Like when, at 4.5 months old, you were at handling class and I felt your body stiffen ever so slightly and the “judge” give you a look. Both occurred in a split second as she moved down your body to finish her examination. I will never forget the look on her face. Did she know something? She never spoke of it. Or when, at 5 months old, you were being petted sweetly by my daughter’s friend’s mom and a few kids and other parents, and you lunged at her barking aggressively. One of the parents grabbed his child and pulled her back and commented that “he is too big a puppy to not be friendly.” I was shocked and apologetic and utterly horrified. I told you NO in that moment and explained that you had never done that before. I was confused and embarrassed. You were not an aggressive dog. You were just a puppy! And then, just a week or so later, my sweet neighbor came over to chat while I was getting you and the kids in the car. This was pre – TwistStep, so I needed to lift you in. My neighbor could see I was in need of help and as soon as she walked toward me, you lunged up and barked at her aggressively. More apologies. What in the world?! Why? That wasn’t the first time you met her. You knew her! Still no kisses. And no wagging tail. By this time, you had been through Puppy Obedience and Level 1 Obedience as well as many handling classes. I took you to your first dog show when you were 6 months old. We got a courtesy blue ribbon in the 6-9 month puppy class because you were the only puppy. I was just happy to not completely embarrass myself as your handler. Yes, I worked full time, but you were given daily outings and opportunities for socialization. Trips to Petco and PetSmart, Pet Club and Pet Food Depot as well as evening dinners at numerous restaurants with outdoor patios in town. We went to your Veterinarian once a week just for a weight check, some treats and loving attention because I knew that you needed to learn to love the vet. You were never crated for more than 4 hours at a time. 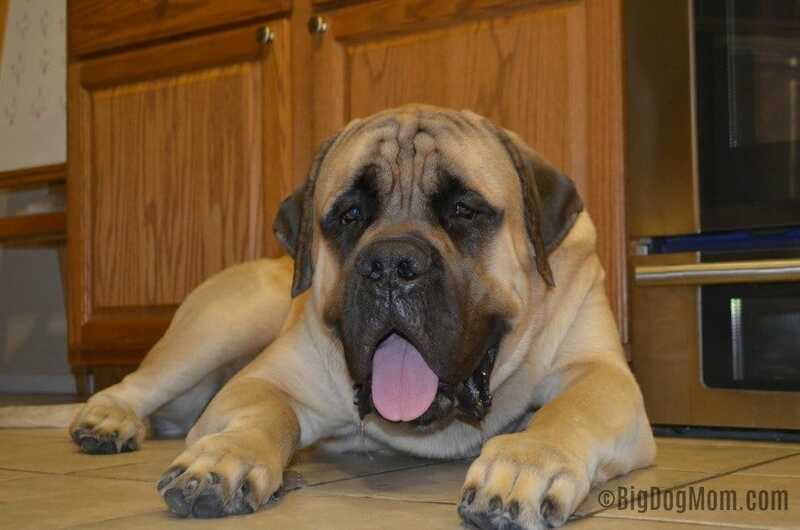 You were not my first mastiff or my first big dog by a long shot. 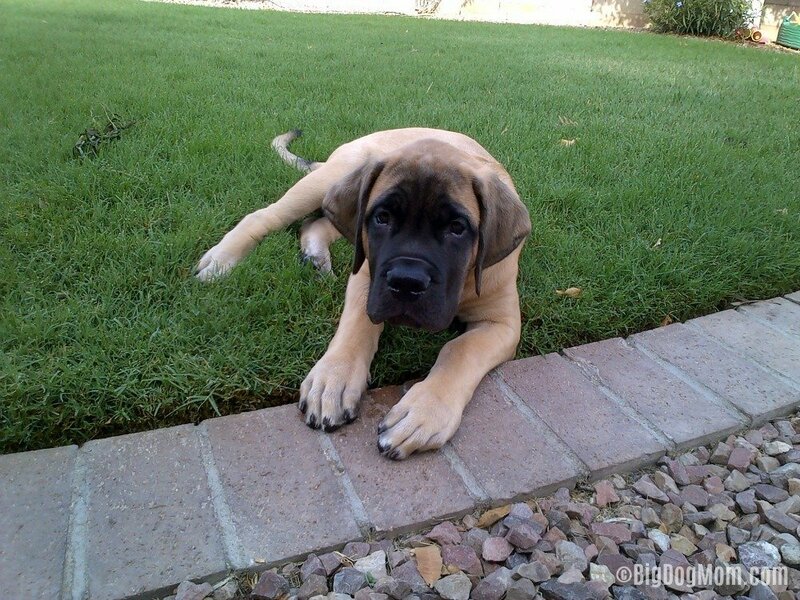 I was not new to raising and training a mastiff puppy. But you were different. And with that, I was new. Over the next couple months, after several more lunging incidents, and being told that all you needed was more socialization, I signed you up for doggie day care. I paid $300 for 6 days of daycare. The folks at day care were excited to meet you. I was so hopeful being surrounded by all the other dogs, you would have fun and learn that people just want to be your friend. About half way through the first day, the head trainer called. You would not be able to come back to day care due to your aggression toward the trainers. She recommended you come for intense behavioral rehabilitation reserved for aggressive dogs. They assured me they had seen your “kind” before and they believed they could help you, and me. Over the next 6 months we spent roughly $4000 in behavioral modification and training. Fear Aggressive Dog Or Something Else? But there was no reason for your aggression. You were never abused or spoken harshly to. Your lunging incidents were not met with punishment. In fact, some might say you “got away with” your behavior. By this time I had read so many books about fear aggressive dogs and spoken to numerous behaviorists that I believed people’s reaction to you (backing away) served to reinforce your behavior. If it was true that you feared them, this made sense. However, you never looked the part of a fearful dog. You never once coward, backed up, or had your tail tucked beneath you. Aggressive Dog Excuses Or Denial? Looking back, did I make too many excuses for you? Like when visits to the Veterinarian became increasingly dangerous. Despite my efforts to give you an exhaustive walk right before your appointment, the techs you once let pet you now feared you. I don’t know if you remember, but on one occasion the vet actually brought in a muzzle. I remember feeling an out of body experience that day. ME, with an aggressive dog that now needs a muzzle?! I raised you as a puppy. Was it something I did? Was it something I failed to do? Or when walks in our neighborhood were wrought with risks. On numerous occasions people would drive by us and they would slow down to admire you and you would return the complement with a stiff growl. I said it so many times I can quote my response “Oh, thank you so much! He’s really a very sweet boy, but he’s still learning. He’s very much still a puppy.” That would usually appease them and they would move on. Eventually walks had to be done in the evenings by my husband so you had fewer demons to face. After all of this, I was told what you really needed was a road trip with a handler. Being out on the road meeting thousands of people. You would learn that people are not bad. I was confused. Had you not learned that already? Perhaps she was right. A road trip was what you needed. Two months and several thousand more dollars, you were an AKC Champion at only 18 months old. You had been doing so well and I was so proud and hopeful. Maybe the nightmare was over. Or not. On the day you were scheduled to take your Canine Good Citizen test (in my mind proof of your rehabilitation), you decided to lunge at two handlers before ring time. You were pulled from the show that day and for the next two days as well. No Canine Good Citizen test. No Canine Good Citizen. I felt hopeless. I drove 25 hours to come and watch you for your last show. I could not wait to see you! Your handler asked me to wait to greet you so that you didn’t get too excited before going in the ring. I waited across the room and watched you come out of your crate. There were people all over the place, and look at you! I was so proud. And then I wasn’t. I still have the photos and I can hear the sound when I think back. It only took a split second. My admiration turned to horror as I witnessed you calmly stand to be petted by a sweet young adult woman, then leap up and bite her in the chest. I could see your teeth pull away the lady’s shirt from her chest. That was it. One lunge, one bite. Your first bite. And your last. We had choices. I was told we had choices. We could choose to neuter you and keep you confined to our yard and muzzled around other people. After all, you loved us, right? We could put you on any number of anti-anxiety medications, and, still keep you confined in our house. We could re-home you as sending you back to your breeder was not an option. But wouldn’t re-homing you just shift the risk from one person to another? With the first two options, would my two small children be capable of understanding why their friends could never “say hi” to you? Was it right for me to put the burden on them should they slip up just one time? We made a choice. I made a choice and I said goodbye. I will never forgive myself, but it was the right choice. I am sorry I let you down. I am sorry I couldn’t do more. You will always have a piece of my heart my Sweet Baboo. Until we see each other again. I can understand your devastation and heartbreak over having to make that decision. I even understand your feelings of guilt, but you did everything you could. Thank you so much. Perhaps you are right about him turning on me, however, my greatest fear was for my kids. I do still have incredible guilt over the outcome, but even this number of years later, I don’t know what more I could have done that would have ultimately changed the course of his progression. I feel your pain. When I was young, we had a cocker spaniel with the same situation. As she got older, the biting got worse. Happening with kids vs adults mostly. Long story, but she went after a boys throat and was put to sleep immediately on Christmas Eve. As it turns out, her entire litter had issues and at a later date, we learned there was inbreeding going on. Seemed to be genetic, but heartbreaking none the less. You did all you could and more. I’m sure he knew how much you loved him. Big hugs. Oh, Lori, I’m so sorry about your cocker spaniel. I’m sure that experience made quite an impression on you and is something that you now take with you. I am sure that will be the case for my children. I am torn between feeling the guilt of putting my children through this and being thankful for the educational opportunity it provided them. I can’t thank you enough for your kind words and support. They truly mean the world to me. Thank you for sharing your brave Baboo story. 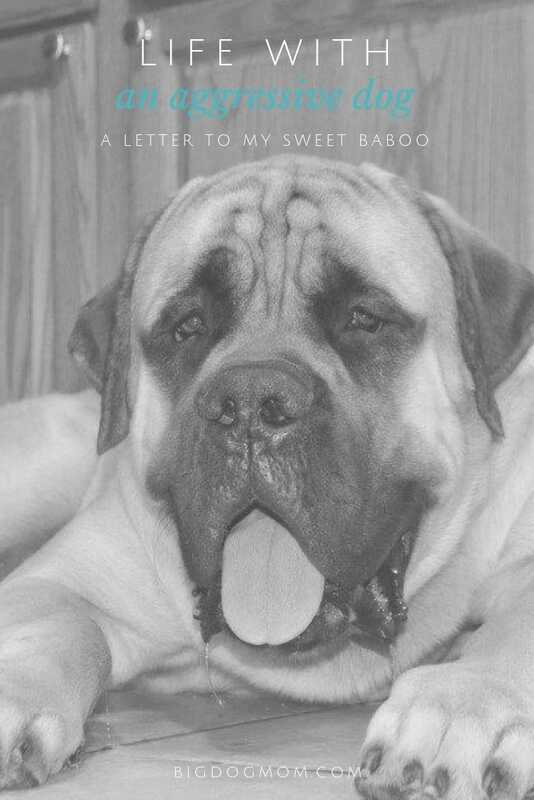 I cried reading about Baboo because I can relate. I have blamed myself, as do others who say that my dog’s bad behavior is my fault. My EM can be startlingly quick and randomly aggressive. He too was raised lovingly, with time, exercise, training and doggy daycare. He was well socialized; he was a very chatty, energetic, happy puppy. At 6 months he won (5 points) at a major dog show. He loved to train, work, play and he enjoyed all the attention. At about 7 months he started reacting (from zero to 10 in a 1 second) to bicyclists, joggers and other alpha EMs, including his nephew and former playmate. I’ve spent hundreds of hours and thousands of dollars on training, behavior consults, veterinary visits, etc. He received his CGC Aug 2012. Shortly afterwards, he dragged me about 50 yards down a gravel road. I wouldn’t let go, fearful he would harm the bicyclist. So, just shy of 3 points for his championship, I neutered him when he was 3 years young. Increasingly my EM became more reactive on walks, etc. Since my husband left us, I thought the aggressive behavior was a phase. That he was protecting me and likely sensing my fears and depression over the subsequent divorce. Things calmed down for a while and fortunately he’s always been very good at the vet, groomer, etc. I tell them to muzzle him, to be safe. They put it on, but tell me his tail droops and he looks so sad until they take it off; that he’s sweet and has never even growled. But he increasingly lunged very aggressively at many people during walks. We now mostly walk late at night, since during daytime walks, so many people approach and admire him. I say Please do not pet him! Yet some do anyway!?! I engage him in various activities like Rally, Advanced Obedience and Nose Work. As a working breed he LOVES to work and loves the people & female dogs he knows. He’s exceptionally sweet, playful and gentle with any puppy. But children freak him out. It is scary and embarrassing for me and more importantly, I don’t know how to better rehabilitate or help him. I don’t know the root cause for his fear aggression and random outbursts. Thankfully he continues to attend a very good, professionally staffed dog daycare and training facility in Seattle. But when there’s a new trainer or worker, it takes at least 6 months for my EM to trust them (and vice versa) and allow them to walk and/or work with him. This is my reality. The heartache, guilt, and fear remain. So many people are very quick to judge, including the old me, before I had a reactive dog. I absolutely empathize and have become much more gracious, kind and compassionate for others who share their love and life with a reactive dog, especially a “gentle giant”. Daily, I try to do my best for him, to manage him as safely as possible and help him lead a happy, balanced life. Thank you again for sharing. There is some comfort knowing I’m not alone. First of all, my heart absolutely goes out to you. I’m so sorry for what you are going through. How wonderful that you are able to go out with him and engage him in positive, stimulating activities like Rally and Nose Work. I have no doubt that those are of huge benefit to him. It sounds like he’s only really reactive on walks and takes some time to warm up to new people. I am not a trainer or a behaviorist, but I am curious about three things: 1) Did anything happen to him when he was 6-7 mos old while you were on a walk that might have imprinted on his brain to be on guard on walks? 2)Has he ever been aggressive toward people he knows or bitten anyone, and 3) How does he behave when people come over to your house? Puppies have several fear periods during their development, one at around 8-10 weeks and another around 7-9 months, when they are particularly sensitive to new experiences and vulnerable to negative experiences. It sounds to me like you are doing everything in your power to continue to work with your boy and I commend you for that. Truly, from the bottom of my heart, I feel for you. I know the loneliness you feel, but you are right, you aren’t alone. But, after Linus, I am convinced that some dogs just can not be fixed. I know that is not easy to hear and I’m not saying that applies to your boy. For me the risk of Linus biting another person, or my children, was too great. And as much as I loved him, I had to let him go where he would be able to find peace. Hi, Thanks so much for sharing your story. I am currently going through something similar. I recently got my second Boerboel pup. He is half brother to my wonderful nine month old female. But he is different. Within 24 hours, this puppy had three fairly serious ‘Resource aggression’ responses; the third, clamping down on my arm pretty impressively for an 8 week old pup. Very dismayed and upset, I contacted his breeder who has simply disregarded me and chosen to not respond. I contacted other Boerboel breeders, and my vet, who all advised me to euthanize him, as this type of aggression is unpredictable and too dangerous for a dog that will be 200 lbs. For a week, I hand fed him, every two hours, ‘traded’ whatever was in his mouth for something better. He seemed to be doing so well, but after 7 days of this, another aggression response, to the same thing we had been doing 6 times a day. He is 12 weeks old. When he is not having an aggressive response, he is perfect and darling. But I know he is different. I still sometimes feel him ‘stiffen’ over food or possessions. I know this is not acceptable behavior for this breed particularly. I don’t want to wait until he is big enough to really hurt someone, or my sweet female. But he is a baby. As much as I want to make him be alright, I know in my heart that I will never be able to predict that aggression response. Knowing this, I will feel terrible, and responsible if he seriously harms someone. But my heart is so broken over the choice I am faced with. Bernadette, I don’t know where to start. First of all, thank you for your note. I’m so very sorry and heartbroken for you. I don’t know where you are in your decision, so I will try to offer just a few thoughts. My first thought is that while, yes, this is not ideal behavior for any dog, he is still a very young puppy. Resource guarding is quite common and is something that I know has been successfully treated by many behaviorists. I can think of a couple off the top of my head, but I’m sure there are others. Patricia McConnell and Pamela Dennison are two of my favorite behaviorists that have had great success with treating aggression. I would also ask for you to consider what is happening when he reacts like this. I have had many dogs “stiffen” over food or possessions like toys or bones, but not react in biting me. Our lab, the sweetest most gentle dog in the world, would stiffen a little bit if I walked over to him to grab his bone. Now, he never growled or bit, but he did stiffen a little. I am not at all suggesting that you should accept your baby’s behavior as normal or not a problem, it is. I agree with you that it is cause for concern and early intervention. The second thing I would suggest is going about your training a little differently. So I was always taught to take the bowl away and give it back or trade the bowl for something better. A trainer friend of mine suggested a better method: from a distance (TBD by the dog’s body language) toss pieces of steak or something super yummy into the bowl. Over a few days or longer, you will be working on moving closer and closer to the bowl, again, while periodically tossing super yummy food (not kibble or dog treats…super yummy stuff). The idea is that the dog will associate super awesomeness with your presence near his bowl, rather than competition or that he needs to protect it. I am not a trainer, but this methods makes so much sense to me. If I were in your shoes, I would absolutely try it. The last thought I had is about your other puppy. Where is she when you are feeding him? Perhaps keep them well separated while you are working with him during meal times. Just a thought. Lastly, I understand your fear. If you still have your boy, please get the help of a professional or maybe find him a new home who can work with him. Boerboel’s are a tough breed, for anyone, even an experienced home like yours. If he is friendly toward people and other dogs, I believe there is hope. Please let me know how he’s doing or if there’s anything more I can do to help. Please feel free to email me or PM me on Facebook or Instagram (@bigdogmomusa) or I’m happy to chat live over the phone. Such a heartbreaking story. He’s beautiful and I can’t imagine how devastated you were. You made the right decision; especially since you have children. 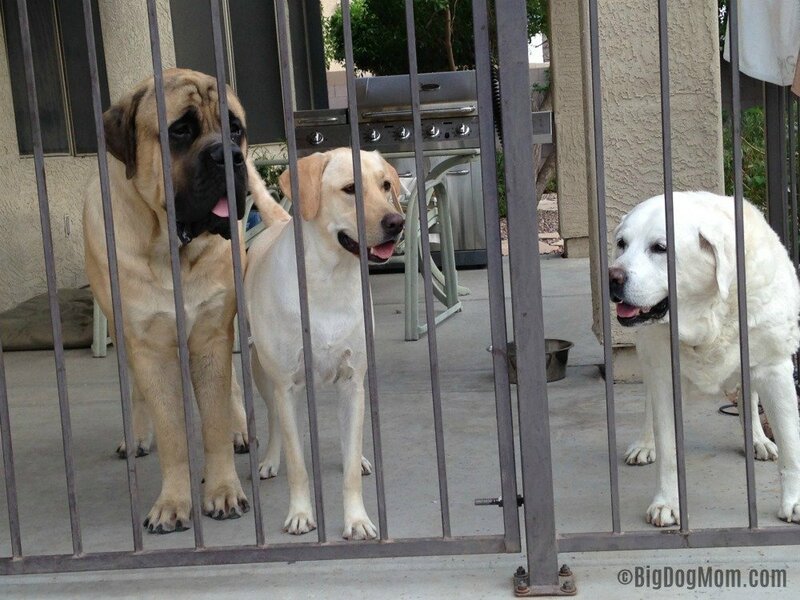 However, as a Mastiff mama with 2 young kids, I can understand how difficult this was. Thank you for sharing.